You are here: Home Forum Regional Forums FGSE largest Antique boat show in the country in S.E. largest Antique boat show in the country in S.E. TOPIC:	largest Antique boat show in the country in S.E. BRIAN: Here is a early pic of the grassy (BEACH?) maybe about 2002 where some of the early FiberGlassic people from the North east met up with some of the Southern members.. This Blue Glastron Scimitar was redone by active restoration member Tommy ion Tampa.. This park setting of Mt Dora was very photogentic by the red stripe LightHouse. . You are correct in the show getting bigger in Tavares. Takes a lot of Sunnyland chapter volunteeers to run the event. 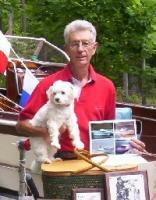 Early spring is warm informal gathering of the boating hobby & rub elbows with organization heavies.! Aristro-Craft owner Bill Turner Here & wife Gail are very active in ACBS. He posed for one of my pics after I noticed his name tag.! Me and my wife Lana are planning to attend the dinner on Friday do we mail you the money or pay you when we get there. I am trying to find info on a Fun Craft for a friend. I says it was made in Florida. ...CAPT. : The spring central Florida show will be Marth 23 Friday to Sunday March25th .. This is suppose to be the 25th Annniversary. Known as the Town Of Tavares. for 2012. For those of you planning on attending this event a word of WARNING for you. Two years ago I had items stolen out of my G-3 at this event! Keep a close eye on all of your items so this does not happen to you.